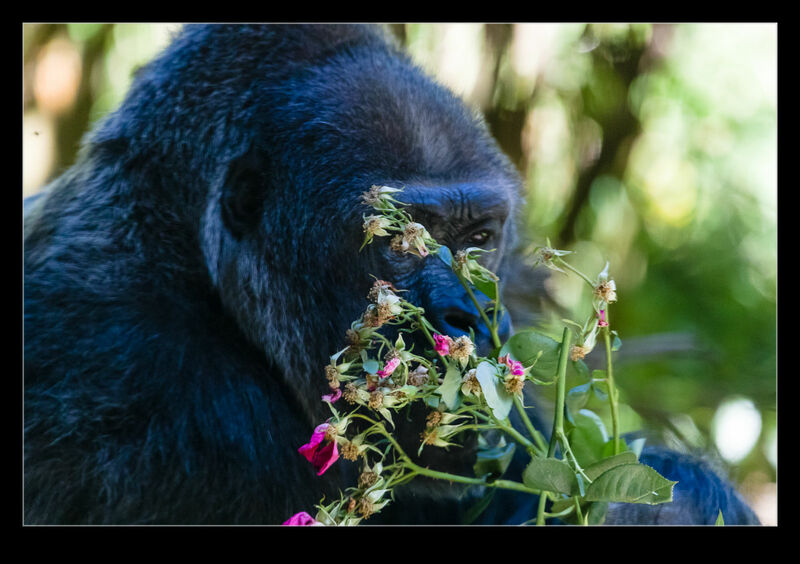 I knew that gorillas were vegetarians, happy to chomp on branches and leaves for hours at a time. What I didn’t know is that they have what I guess might be considered a sweet tooth. They were scattered throughout their enclosure but two of them were together in one section that had a glass viewing wall for the other apes to watch them. The staff had recently put a load of food out for them and this included some bunches of flowers. When I first saw the flowers, I was slightly perplexed. It seemed like an odd thing to have put out. However, the alpha male homed in on them. Even then I assumed he would eat the leaves. Not so. 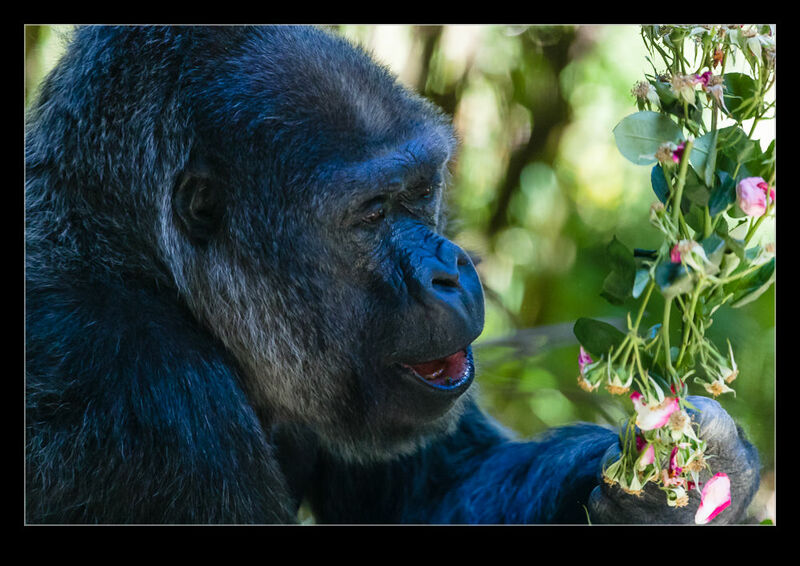 He was happy to strip the flowers from the branches and chew them up. The rate at which he went through them made it seem pretty clear that this was a preferred treat for him. Having never tried eating flowers, I have no idea what they taste like. They smell nice so does that translate into a nice flavor? I’m not going to try eating some to find out but, judging by his approach, there must be something to them. 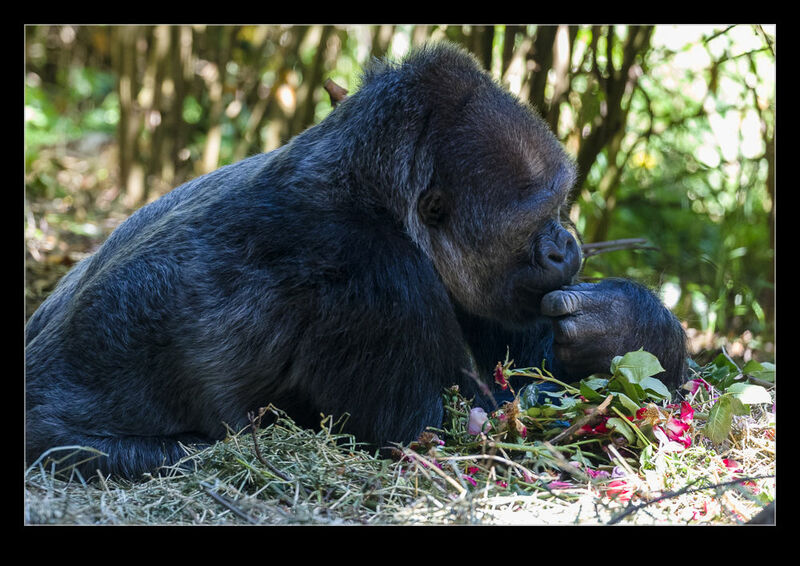 This entry was posted in Pacific Northwest, photo, wildlife and tagged eat, flower, gorilla, mammal, photo, seattle, washington, wildlife, woodland park zoo. Bookmark the permalink.